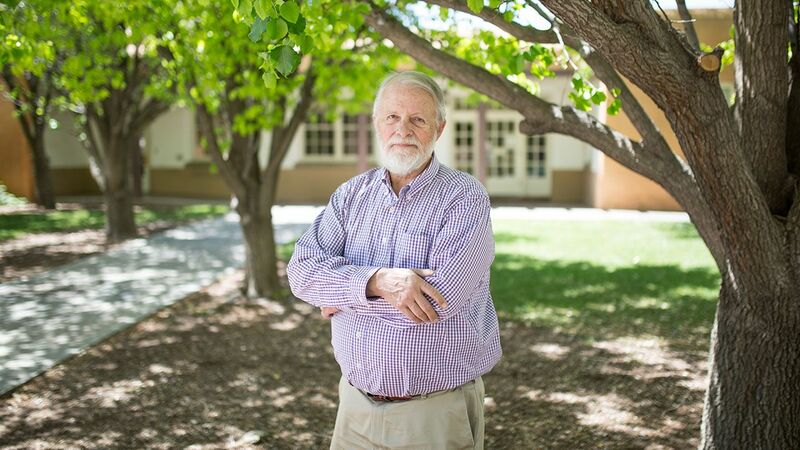 After more than four decades at The University of New Mexico, Department of Chemistry & Chemical Biology Professor Richard Holder is saying goodbye after a long and distinguished career. The department is hosting a celebration to honor Holder on Wednesday, May 3 from 3 – 4 p.m. in the SMLC Atrium. All are welcome to attend. A Wyoming native and graduate of Yale University, Holder came to UNM in 1974 as a tenure-track assistant professor after a stint at Vassar College in New York state. Over the next 43 years, he would go on to serve UNM in a variety of roles and make the jump into faculty administration, a move inspired by a year working as a program director with the National Science Foundation. In 1986, Holder moved from a fulltime position in chemistry to UNM’s Provost’s Office – where he stayed for 25 years, working in several positions including Deputy Provost and Dean of University College. And, while he never entirely gave up teaching, something he says had a positive impact on his administrative efforts, he says it was those years working in Provost’s Office where he feels he made the biggest impact. During his time in the Provost’s Office, Holder oversaw tenure & promotions, the hiring process as well as student complaints and grievances. He says one of his most memorable accomplishments was helping bolster UNM’s Honors College – which, at the time, was not yet an accredited college. Today, he’s proud of the fact that UNM has one of the most robust and successful Honors Colleges’ in the country. Over the years, Holder saw nine Provosts come through the office, and while he enjoyed working at that level, helping shape the University in many ways, in 2011, he made the decision to leave the Provost’s Office and go back to teaching fulltime. And it’s those relationships, the interactions with his students and fellow faculty members, he says he will miss the most. But, even though he will officially retire after this semester, Holder says he won’t completely disappear from campus. He plans to continue to work in the department and has not ruled out the possibility of teaching a class or two in the future. For right now though, he says he’s looking forward to doing a bit of travelling and spending more time volunteering with the local horse rescue, Walkin N Circles Ranch. The non-profit organization, which Holder is Board President of, rescues mistreated and abandoned horses, rehabilitating them before adopting them out to good homes. It’s a cause he says is close to his heart. “I’m originally from Wyoming, so doing something with horses is sort of a genetic thing,” he said. According to their website, Walkin N Circles has rescued more than 60 horses with 60 more currently at their ranch in the Edgewood area. Holder hopes to be able to dedicate more time to the organization and help it continue to grow and save more and more horses in the future. As for UNM, Holder says he’s grateful for everything the University has done for him and the relationships he’s been able to build here. And while it’s not secret that UNM is facing some big issues across campus, he says it’s important to remember all the good things that happen here every day.